Purrdelis is proud to welcome our newest addition, a beautiful brown tabby female American Shorthair named Delilah; or, more properly, CH Caellcat's Delilah of Purrdelis. 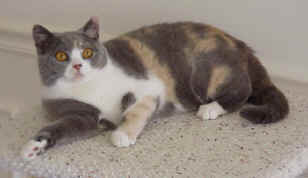 Delilah comes to us from Ann Caell, a distinguished American Shorthair breeder in San Jose, California. Delilah is the full sister of CFA's 1999 National 8th Best Cat in Championship and 4th Best Kitten, GC,NW Caellcat's California Dapper Dan. 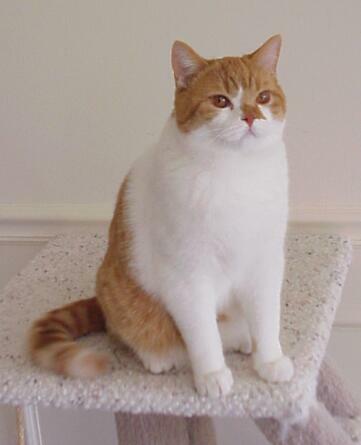 We are so pleased and blessed to begin our American Shorthair breeding program with such successful lineage. Purrdelis is pleased to announce our newest Grand Premier, GC,GP, RW Purrdelis' Gettin Jiggy Wid It -- or just Jiggy for short. 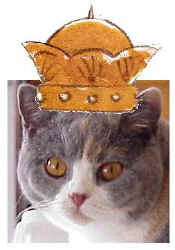 Jiggy granded in real style by earning Best Premier in all eight rings at her last show, also earning four Best Cats, and two 2nd Best cats in the process. What an all star! We were hoping to have one more litter from Jiggy, but she told us that she would rather be a pampered spay. She has blossomed into one of the most beautiful cats we have ever seen and is such a joy to be owned by. Please help us to congratulate her on her great achievement. But do pardon Jiggy if she doesn't join in our enthusiasm. She's too busy napping by the fire. Purrdelis is very proud to announce that two of our cats earned very distinguished honors during the 1999/2000 CFA show season. We had two regional winners, one of whom was also a national winner! Please join us in admiring and congratulating C.C. and Jiggy, the latest Purrdelis' Hall of Fame inductees! 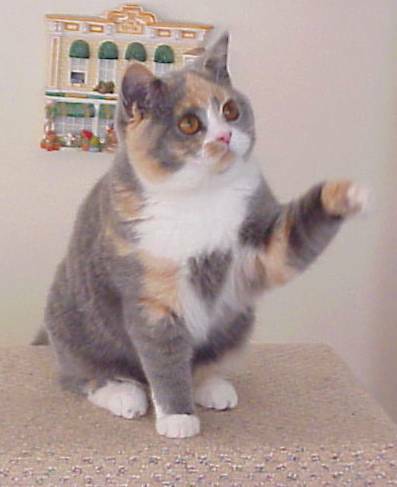 Purrdelis' British Shorthairs is pleased to announce their newest and youngest CFA Grand Champion, GC Purrdelis' Gettin Jiggy Wid It. Jiggy was only nine months old when she earned her Grand Championship in early May of 1999. We've always thought Jiggy was special, but it is nice to know the judges agree with us! This year has brought with it many goodbyes to beloved feline family members. Simone, aka CH Purrdelis' Parlez Vous Francais, recently went to live with a very nice family in Seattle, where she is now sister to a devilish Manx named Tristram. Reports so far are that she is settling in very nicely. Tristram seems to have accepted his new companion and continues to be fascinated by the long furry thing attached to Simone (her tail) as he has never seen one of these before! Simone's sister Claudine, who is also known as CH Purrdelis' Jump Jive and Wail, left us to join Sandy and Ruth in Tacoma where she is suitably spoiled. Claudine had found herself as the lowest kitty on the hierarchy totem pole at our house, and we had to make the hard decision to part with her. Now she is part of a cat duo and stands up for herself nicely. And another kitty has left the litterbox. Cosmo, one of the great patriarch's of the Purrdelis' clan, has taken up residence not to far away in Bothell. GC,GP Belle-Luna's Cosmo's Moon keeps his new mommy company as she recovers from back surgeries. She let us know that he is such a blessing. And we know that he is one of the best lap warmers and head butters around. Rooodeee, Rooodeee, Rooodeee. . . A kitty I never thought that I would part with is currently training a very nice family in all the aspects of human -- I mean cat ownership. Rudy is also known as GP Purrdelis' Rude Awakening. He is the sole feline in residence with the Hyman family, and is their introduction to the wonderful world of cats. They could not have a more purrfect welcome wagon into the incomparable world! With his Grand Premiership, Rudy has become the fifth cat produced by our lovely dilute calico, Chauncey, to become either a Grand Premier or Grand Champion. This distinction means that Chauncey was then bestowed the title of Distinguished Merit (DM). Or, in other words, GC Castway's Chauncey of Purrdelis, DM. 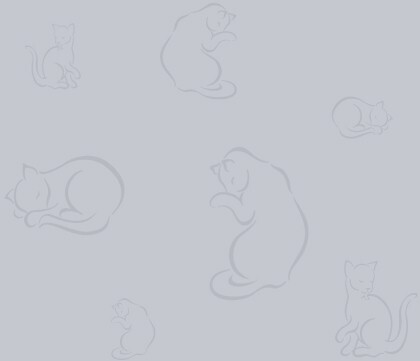 What makes this even more an honor, is the fact that all of the cats above are bi-colored cats. In a breed known and rewarded for its solid color blue, we here at Purrdelis think it's a pretty cool achievement to have earned our first Distinguished Merit title with bi-colors -- and a couple controversial bi-colors at that! Thank you, Chauncey for all the beautiful babies! Now that Chauncey has attained her esteemed Distinguished Merit title, she has retired to a new home. Chauncey, the kitty who brought us much joy and furry love has moved in with a new family in Pullman, Washington. She is now the only cat with people of her own to purr and prance for. Recent reports have her settling in nicely. Although we miss her, we thought she deserved to be royally pampered in her retirement, are so happy she is in a place where she will be the treasured queen of all she surveys! Congratulations are in order for one of our kitties. Despite being retired since December of 1998, GP, RW Brittingham's Glory Be of Purrdelis, hung on to become the 18th Best Cat in Premiership for CFA's Northwest Region. Yay! Little did we suspect when Glory arrived in our home two short years ago that her name would foretell her future -- GLORY! We would like to thank all the judges who chose to honor Glory in her show career, and also to congratulate all the winners this past show season. We, here at Purrdelis, are so happy to announce a wonderful pairing -- GP, RW Brittingham's Glory Be of PUrrdelis and Joseph Compagno. Glory now "owns" a new person to wrap around her little paw! 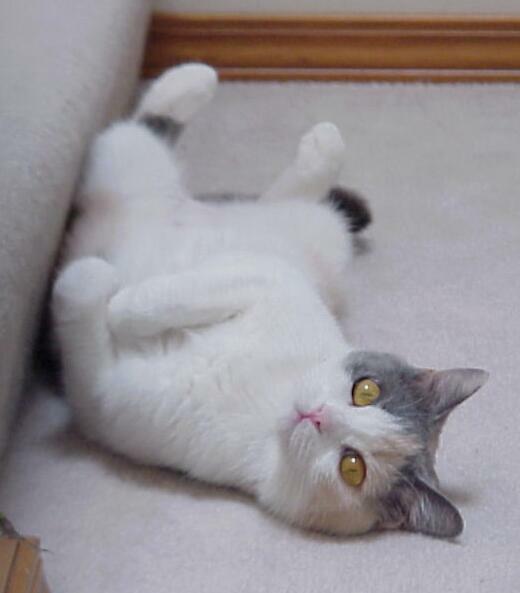 Glory is Joe's first cat, and we believe that she will have him trained in all the intricacies of human. . . we mean CAT ownership in no time! Thank you, Joe, for loving Glory as much as we do and for giving her her own castle to preside over!